Jenni Ferguson is the Clinical Director and the newest member of TeamSmile. Jenni comes to us with almost 7 years of experience overseeing all aspects of the Kansas School Sealant and Screening Programs with the Bureau of Oral Health. Currently Jenni sits on Association of State and Territorial Dental Directors (ASTDD) School and Adolescent Oral Health Committee whose mission is to promote the importance of good oral health practices that improve the oral health of school-age children and adolescents through education, networking and collaborative partnerships at local, state and national levels. She has been an active partner with Kansas Oral Health Connections that partnered with Oral Health Kansas, Kansas Association for the Medically Underserved, and the Kansas Head Start Association. Prior to Jenni’s work with the state, she was a Professional Relations Representative with Delta Dental of Kansas, who traveled the state visiting and education dental offices. This was familiar territory since Jenni is also a registered dental hygienist who worked full time in private practice for 8 ½ years. 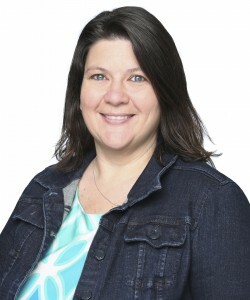 Ferguson’s formal education includes an Associate of Arts degree from Oklahoma Wesleyan, Associates of Science in Dental Hygiene from JCCC and a Bachelor of Arts in Business Administration from Capella University. Jenni has a wonderful spouse, Jason, who is the Apprentice Coordinator for the Sheet Metal Workers Local Union 2 JATC and three amazing children: Madison, Riley and Aiden! Add three dogs to the mix and you have a full house. In their spare time you can find them at either a soccer game, Boy Scout event or camping at one of the state parks in Kansas or Missouri.